This fabulous Classic car tour will visits the Art Deco Historic District with colorful buildings with a century-old history. South Beach or SoBe as the locals call it, is a mixture of cultures, styles, way of living and a unique cocktail that you won't be able to find in any other city. 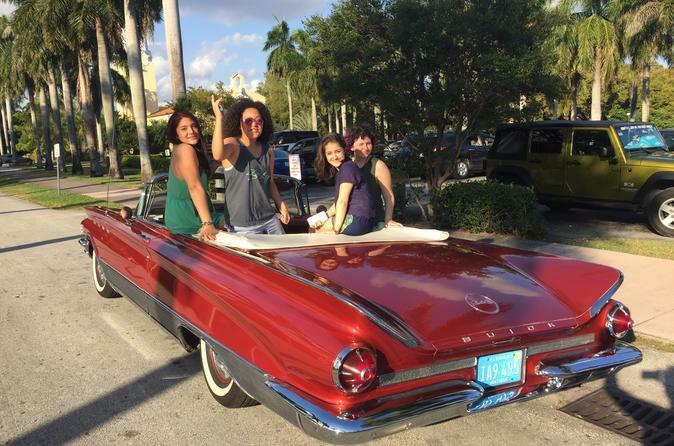 Cruise on board our American Antique Convertible Car the famous Ocean Drive and discover the unavoidable Art-Deco buildings along the beach, pass by Gianni Versace Mansion, Colony Hotel and many more famous buildings. Your private chauffeur will drive you all around, passing by the Holocaust Memorial, Wolfsonian Museum, The Fillmore theatre and many others landmarks. Going down on Collins Avenue, you will appreciate the MiMo architecture, buildings painted with pastel colors, as well the Fontainebleau Hotel, open in 1954 and designed by Morris Lapidus. You will have a full picture of the world famous Miami Beach ! This Grand Tour of Miami in a classic convertible car will then cross Biscayne Bay to Design District and Wynwood, and its famous graffiti. Touring Downtown Miami, and sight see through Brickell, business center of the city, continuing to Coconut Grove, the oldest structures of Miami and home of Miami City Hall, and also Villa Viscaya as a highlight. Coral Gables, known as the “City Beautiful”, with lush green avenues and canals, is our next stop. Its Mediterranean Revival architectural style from the 20’s is spectacular. The tour will make a quick stop at the Biltmore hotel, built in 1926, and the incredible Venetian Pool, built in 1923 from a coral rock quarry. “Feel for Una Collada?” So let's tour Calle Ocho to Little Havana and take a slice of Cuban culture, taking a rest to watch the elderly Cubans playing dominoes or to try a free Cafecito.